We bought a house. Holy crap. We got a super cool (and in desperate need of renovation/love) 1920’s rowhouse in Lawrenceville and we wasted no time getting to work. We closed last Friday and 1 hour after the closing, this baby was delivered…. Yes, it’s enormous but thankfully we got the bigger one because it’s filling up fast. Who would have ever thought pulling down ceilings and walls was so dirty?? 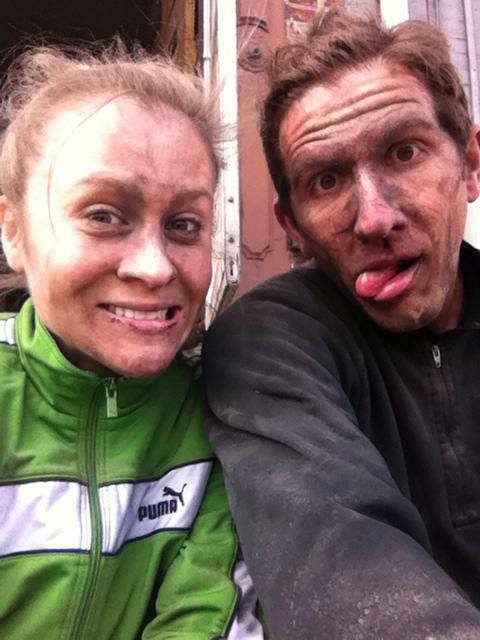 Too bad it’s not Halloween…we could go as coal miners. I always look forward to reading your new post on the blog…cannot wait to see the end results with your new house. Keep up the good work!!! Congratulations!!!!! with the New house….. when you guys are done, all your hard work and getting dirty will be so worth it… I’m not a home owner yet but I’m hoping I will be in the next couple years….. Thank you!! I rented for a LONG time…this house came to us nice and easy…when it’s right, it’s right. Yours will come!! We’ve owned our house for 33 years now, still not done remodeling!! By the time we’re done, everything will be outdated!! Lol Take your time and when it comes to conflicts of your tastes, one word of advice…COMPROMISE!! And if you do fight about anything, remember, do you want to be right, or do you want to be happy? ?